One of the convictions that I started college with is “Look to see where God is working and join Him.” It comes from Jesus saying in John 5:19 that “the Son can do nothing by himself; he can do only what he sees his Father doing.” If Jesus can't do anything meaningful on his own, then it's a good bet Brandon can't. It was with that conviction that I joined FOCUS at Richland College my freshman year, even though I was a UTD student. It was because I saw God working in their lives that I chose Leah Farmer (Lorenz), Mandy McWilliams (Lanciani), Kris Green, Beth Johnson (Lynas), and Tiffany Palmer as my close friends that first year, even though only Mandy was a fellow UTD student. But, the Lord brought them all to UTD at the start of my sophomore year, and FOCUS at UTD was born. Fast forward to 2014, and that UTD ministry has helped start ministries at 5 other campuses and trained scores of leaders for the kingdom. God always knows what He's doing! Over the course of this year, I've started seeing His hand moving toward UT Arlington. I've had at least 10 people call me or one of my staff to ask about the possibility of starting a ministry there–students who plan to transfer there or go to grad school there, students with friends or siblings going to UTA, alumni interested in doing the FOCUS internship if they could help start a ministry at UTA. UTA has been on our radar for a long time and has always been a part of our vision–to launch campus missions at every campus in the DFW area. But the timing has been up to God. Over the past few years, I've only been asked about UTA a handful of times, so having so many people talking and praying about it this year definitely has me asking if now is the time! I recently met with the InterVarsity director at UTA, and he was super excited about the possibility of us sending a team. He said the various campus ministries are working closely together in unity to reach the campus for Christ, but he estimated that they are impacting about 1% of approximately 33,000 students. The need is great and the workers are few! Will you join with me in praying and seeking God's will for FOCUS concerning UT Arlington? You might use this page of UTA facts to focus your prayers and get to know the campus. This would be a big move across the city. We would need to send the right team of staff and student ministers. We would probably need to start planning in January in order to be ready for the 2015-2016 school year. Also toward that end, we will launch our first annual “Keep FOCUS Growing” Initiative in the second half of November. Our staff has fundraised to get us through this year, but we are asking God to provide the resources if He wants us to launch a major new campus ministry. So we'll be inviting our students, alumni, current supporters, and anyone else to consider giving a special gift to help us grow our impact in 2015. Keep an eye out for #FOCUS140 in the coming weeks. Thank you for joining me in prayer and for joining with me financially in this work. You are making a difference in students' lives! 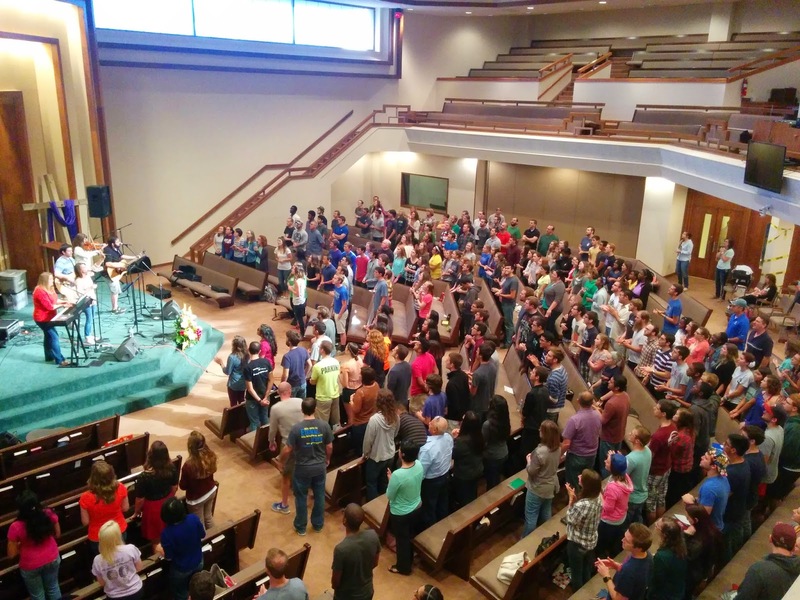 I want to end with a picture from our second annual Church and Campus Leadership Conference yesterday. We spent the day training hundreds of leaders and future leaders on visionary leadership. We had a lot of new students (including many freshmen!) invest a whole Saturday in order to become a better leader. That's a good sign for what's to come!